It's time to get a jump start on your Christmas cards. Join us for a fun afternoon of stamping and getting in the Christmas spirit. You will leave with a total of 16 cards with envelopes (4 each of 4 designs). 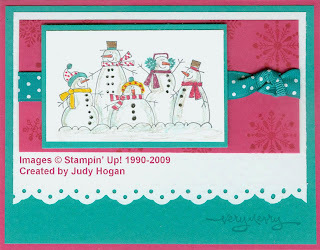 This is one of the cards that was made by my friend, Judy Hogan, for this class. When: Saturday, July 25 OR Sunday, July 26 from 2 to 5 p.m.
Class Fee: $25 if you register by July 18, $30 if after July 18. Your class fee includes all supplies except your adhesive. You may pre-order SNAIL adhesive for $8.28 which includes shipping and handling and tax. If you would like to register for this class, please leave a comment here or contact me at cheng1170@sbcglobal.net.